The Boeing 717 jet is a twin engine, commercial aircraft that was previously built by The Boeing Company in Long Beach, California, USA. On May 23, 2006 the 717 aircraft program came to a close as Boeing delivered the last two Boeing 717 jets to Midwest Airlines and AirTran Airways. The aircraft was first designed by McDonnell Douglas as an upgraded, 100 seat, version of its DC-9 series jet airplanes. The Boeing 717 was originally called the McDonnell Douglas MD-95, before Boeing and McDonnell Douglas merged in 1997. McDonnell Douglas had been considering whether to build the MD-95 and during the 1990's they finally moved forward with the new jet. The Boeing 717 would be an updated version of the DC-9 series, with the latest technology of the time, that was similar to the DC-9-30. The aircraft was launched with an order from ValuJet Airlines in 1995, which eventually merged with AirTran Airways, for 50 firm aircraft orders and 50 options. In 1997 McDonnell Douglas merged with Boeing, in which Boeing became the surviving brand name. Douglas Aircraft Company was the subsidiary of McDonnell Douglas that was building the aircraft. Boeing then changed the name of the subsidiary to Douglas Products Division. In 1998 Boeing got rid of the Douglas name and changed the name of the subsidiary to Boeing Commercial Airplanes, Long Beach. Many believed that Boeing would end the MD-95 program because it already had a 100 seat category aircraft in the Boeing 737-600. Boeing decided to continue with the launch of the aircraft program and on January 8th, 1998 they renamed the MD-95 to be the Boeing 717-200. The official name for the Boeing 717 commercial jet is the 717-200. Before acquiring Douglas, Boeing had called it's KC-135 military tanker, built for the U.S. Air Force, the Boeing 717-100. Boeing decided to use the 717 name since it had been skipped in the commercial aircraft program naming, however they officially called the plane the 717-200 to avoid naming conflicts. Above AirTran Boeing 717-200 Photo by Airwim on Wikimedia Commons. Photo (only) released under the GNU Free Documentation License, Version 1.2. On September 2, 1998 at 12:35 PM the Boeing 717 first flight occurred at the Long Beach Municipal Airport (ICAO: KLGB, FAA:LGB) The aircraft took off and flew over Catalina, an island located off the coast, before turning southwest to land in Yuma, Arizona at Boeing's flight test center. After the first flight a total of five Boeing 717-200s were apart of the test program and flew 2,000 plus hours. The Boeing 717-200 was certified by the Federal Aviation Administration (FAA) and the Joint Aviation Authorities of Europe (JAA, now replaced by EASA) simultaneously under a "Concurrent and Cooperative Certification" program on September 9th, 1999. 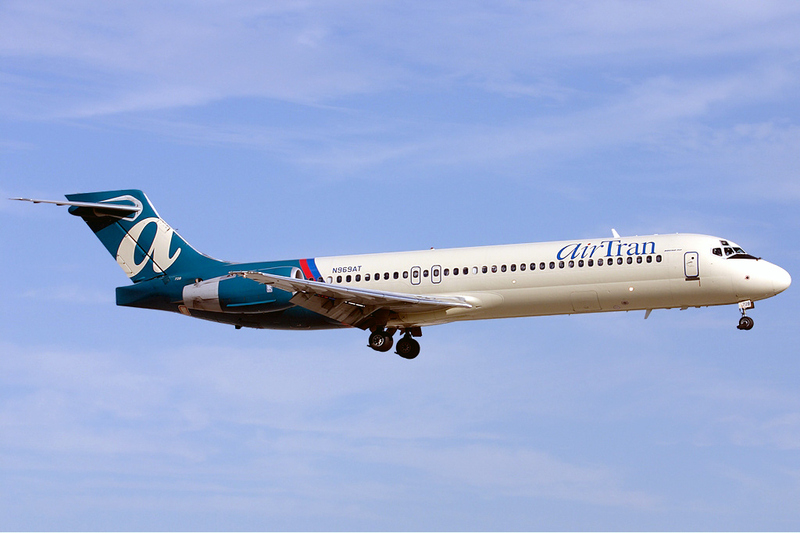 AirTran Airways took delivery of the first aircraft built for airline service and in October 1999 the Boeing 717 entered commercial service with AirTran Airways. On January 15th, 2005 Boeing Commercial Airplanes announced that they would stop building the 717-200 as soon as they completed building already ordered jets. Boeing Commercial Airplanes President and CEO, at the time, Alan Mulally said the following regarding the closure of the program in a news release, "The 717 brings tremendous value to the airlines that operate it. Unfortunately, the overall market for the airplane does not support continuing 717 production beyond delivering on our current commitments." On May 5th, 2006 Boeing delivered the final two Boeing 717s to AirTran Airways and Midwest Airlines at a large ceremony that concluded commercial aircraft production at the Long Beach facility. Boeing produced a total of 156 Boeing 717-200 airplanes during a span of almost 7 years (September 1999 to May 2006). The Boeing 717 remains in service with a few airlines around the globe. Delta Air Lines has become the largest operator of the 717 as they are acquiring all of AirTran's 717-200 jets. The 717 will remain in service as it is still popular among a few airlines. More detailed information is located on our other Boeing 717 pages. Range of 1,430 nautical miles in a Basic Gross Weight configuration. More on the Boeing 717 can be found on the other pages linked in the menu.